New Orleans Saints quarterback Drew Brees (9) talks with a teammate on the sideline during the fourth quarter of a 34-7 loss to the Seattle Seahawks at CenturyLink Field. METAIRIE, La. (AP) — After leading the Saints to a fourth playoff appearance in five seasons, Drew Brees expressed confidence in the direction of his team and, perhaps more importantly, showed a willingness to listen to contract proposals if the team needs his help getting under the NFL’s salary cap. "Listen, I get compensated very well. I don’t take that for granted for one second," Brees said Monday, referring to the five-year, $100 million deal he signed in 2012. "But I play this game because I love this game, I love this locker room and I love the opportunity to win a championship. 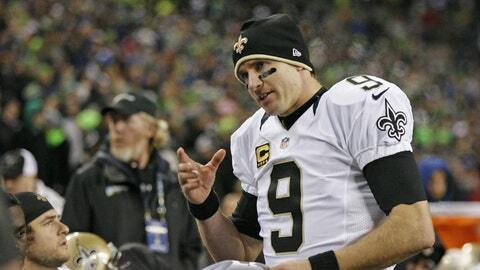 "If they want to come to me and extend me even further, that’d be great," Brees said. "Whatever helps this team win and puts the best team on the field." With Sean Payton returning from his bounty suspension, the Saints improved their regular-season record from 7-9 to 11-5, then won the franchise’s first road playoff game in six tries, beating the Eagles in Philadelphia in the wild card round before falling at top-seeded Seattle, 23-15 on Saturday. Brees eclipsed 5,000 yards passing for a third straight season to go with 39 touchdowns. Meanwhile, New Orleans’ defense went from worst in the league a year ago to fourth in total defense under first-year coordinator Rob Ryan. And that improvement came despite a rash of injuries. All in all, it looks as if the Saints aren’t far off from Super Bowl contention — if they can find the salary cap space to keep some top free agents such as tight end Jimmy Graham, who led New Orleans with 1,215 yards receiving and 16 touchdowns. Brees’ contract calls for him to have a base salary of $10.75 million next season, which along with his pro-rated $37 million signing bonus will put his 2014 salary cap figure above $18 million. Graham has said his preference would be to remain with Brees in New Orleans. The Saints can secure Graham for at least another year by placing the franchise tag on the four-year veteran, but players and teams generally prefer to avoid that route and seek long-term extensions instead. Other starters entering free agency include free safety Malcolm Jenkins, right tackle Zach Strief and center Brian de la Puente. Strief, who has spent his entire eight-year career in New Orleans, said he wants to be back, but would clean his locker out entirely for the first time, knowing the Saints might not match other offers in what he views as his last, best chance to sign a new contract. "Obviously this organization’s been a big part of my life and I feel like I’ve been part of the success here and you don’t want to leave that," Strief said. "The reality of the situation is I think there’s going to be other possible outcomes, and there’s other teams, possibly, and you prepare for that — not because it’s what you want but because it’s the reality." Jenkins, a five-year veteran, said he, too, wants to return, but understands "it doesn’t always work out that way." Still, he emphasized he was proud to be part of a defense that made enormous progress this season. "There’s not a group of guys that I’d rather play with," Jenkins said. "We’ve come a long way, obviously night and day from last year." One problem for New Orleans is that its existing contracts would likely place the club more than $10 million above the 2014 salary cap, which has not yet been set, but is expected to be in the range of $125 million. One way teams seek salary cap relief is by renegotiating with, or releasing, veteran players with the largest base salaries. In New Orleans’ case, those players could include outside linebacker Will Smith, left guard Ben Grubbs, cornerback Jabari Greer, defensive tackle Brodrick Bunkley, safety Roman Harper and receiver Lance Moore. Smith spent the season on injured reserve after tearing a knee ligament in the preseason. Greer had season-ending torn ligaments in his knee in November. Yet the injuries also provided opportunities for younger players, many of whom demonstrated significant growth and will remain under contracts less burdensome to the club. Those included rookie left tackle Terron Armstead, who took over as starter in Week 16, second-year defensive end Akiem Hicks, fourth-year outside linebacker Junior Galette, as well as rookie receiver Kenny Stills and rookie running back Khiry Robinson. Payton refused to address potential personnel moves, but confidently brushed aside questions about New Orleans’ impending salary cap constraints. "We’re going to be in good shape," Payton said. "Obviously when there’s change from season to season, there’s attrition. There’s the younger players that are coming in and the players eventually that have been here that are no longer on the team. I think that’s pretty normal, and we’ll be ready for the challenge."